The 2015 season was just a month old, Lance McCullers was off to a blistering debut with the Corpus Christi Hooks in the Texas League. The 2012 1st round pick of the Astros was superb in the first month of the season striking out 13.5 batters per nine innings. In 32 innings of work, the Jesuit High School graduate held opponents to just two earned runs and during that span had a WHIP of just 0.938. On the afternoon of May 14th, McCullers received word that he would be getting promoted to Fresno and would be just one more step away from the Major Leagues. McCullers arrived in Fresno just long enough to throw a bullpen session when he found out that he wouldn’t be staying with the Fresno Grizzlies for long. During a team meeting to introduce some of the new faces that had recently arrived in Fresno, manager Tony Defrancesco broke the news to the team that McCullers would be making his next start against the Oakland Athletics. In a 24 hour period McCullers went from AA to AAA to the Major Leagues and on Monday, May 18th 2015 he took to the mound to face the Oakland Athletics. McCullers wasted no time picking up his first major league strike out. Sporting batman themed spikes, he quickly got two outs in the first inning and then faced off against Billy Butler. On a 2-2 count in the sixth pitch of the at bat he struck him out swinging for the first of his five strike outs. In his debut, McCullers would go on to pitch 4 2/3 innings but was removed after reaching the 93 pitch mark. McCullers only allowed one run and struck out five while walking three. The Astros bats could not muster enough offense against the A’s and they fell in defeat 2-1. McCullers would remain and play a key role in the Astros rotation for the rest of the 2015 season. 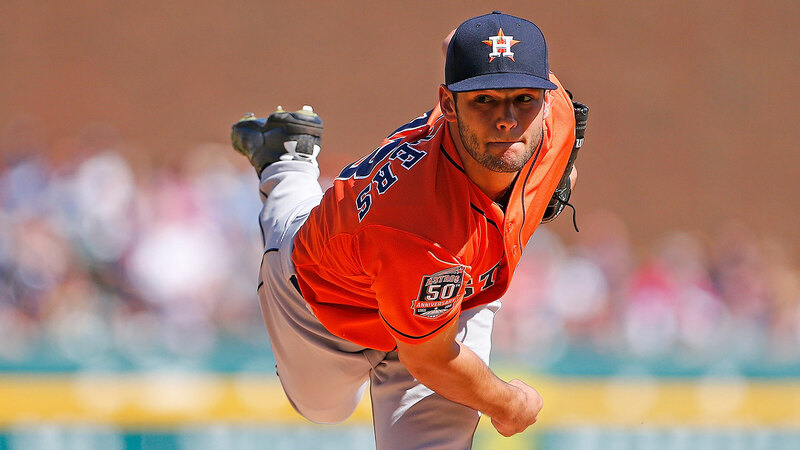 After picking up his 1st Major League win on May 23rd against the Detroit Tigers, McCullers pitched one of the top performances of the 2015 season on June 3rd at home against the Baltimore Orioles. McCullers pitched a complete game to earn his second win of the season allowing only one run and four hits. He struck out 11 Oriole batters and did not throw a walk. It took him just 107 pitches to complete his nine innings of work. McCullers finished the regular season 6-7 with an ERA of 3.22 and a WHIP of 1.186. He continued to post solid strike out numbers at the big league level striking out 129 batters in 125.2 innings of work. The Astros made the 2015 post season and manager A.J. Hinch gave McCullers the ball in-game 4 of the ALDS against the Kansas City Royals. McCullers went 6 1/3 innings allowing two runs and striking out seven leaving the game with the lead. Unfortunately for McCullers and his Astros teammates, the Royals would come from behind to defeat them 9-6 and go on to win the World Series. 2016 is poised to be a big sophomore season for the 22-year-old as he gets set to make an impact as a top of the rotation starter for the Houston Astros. McCullers features a strong mid-90’s fastball and a crisp curve ball. Since being drafted in 2012, McCullers has refined his change-up giving him three solid offers. While some around baseball still see McCullers eventually moving to a back-end of the bullpen role his 2015 season has many now believing that he will be one of the game’s top starting pitchers for years to come. 1. In 2015 you made your Major League debut against the Oakland Athletics. How did you get the news you would be going to the Major Leagues and how did it feel? I was in Double-A to start the year and I had just got promoted to Triple-A. I flew to Albuquerque, New Mexico where they were finishing up the back-end of a three game series. I got there and I was there for one night and I got to watch the game. The next day I was about to get ready to go to the field and I got a text from the team trainer that said to make sure I was at the field by 2 o’clock there was going to be a team meeting. At 2 o’clock the manager called everyone together that was at the field and starts to tell some stories and in the middle he looked at me and asked “How old are you”? I told him I was 21 and he went on to tell us that when he was 21 he was playing baseball in college and he pressed on asking me “Where I would have went to school at”? I was thinking to myself that maybe this was a way for the team to get to know me because I was one of the new guys on the team. Coach went on to tell me that “If I was in school I would be going to class tomorrow but instead of class your going to be going to the big leagues to pitch against the Oakland A’s”. I didn’t process it that well and before I knew it Carlos Correa came over and gave me a huge hug and after that it started to settle in that I was going to the big leagues. I had been in Houston about a month earlier for the exhibition game right before the start of the season. I remember walking in at that time and seeing my name on the back of an Astros jersey and thinking that it would be awesome in a year or two to walk back into this locker room knowing that this is where I play and this is where I got to work everyday. Walking back into that same locker room a month later as a big league pitcher I took a second just to look around and take it all in. I had made it, I achieved my dream! This is what I had been working for, this is what the hours are for, this is what the early wake ups are for this is why we all do it. After that moment though I said to myself now its time to prove yourself and earn your keep because now that I am here I want to stay here. I want to pitch in the big leagues for as long as I can. 3. Do you have any special moments you take away from the day of your debut? I remember that my closest friends and family came into town. We all went to eat together that day, I think the day of the game I went to the movies and saw Pitch Perfect 2 to keep things light. I just wanted to enjoy the moment and share it with everyone. The people who were there were the people who have supported me from day one. They were they from little league baseball through high school and all the way up through the minors. It was really great having all those people there to share in this special day. 4. You had a successful rookie season after making your debut. What were the big things that you learned from the time you spent in the majors last year? The biggest thing I learned is you have to be able to adjust. The adjustments you have to make and the attention to what every batter does. If you don’t make those in-game adjustments that you sometimes can get away with not making in the minor leagues your going to get yourself in a lot of trouble. I experienced that a couple of times where I went in the game with a plan and I didn’t realize in the first or second inning that the plan was not working. It could be a specific pitch I planned on using wasn’t being effective and a couple of times I got hurt by it. Those instances made me realize that I need to be more on top of my game and adjust on the fly if I want to be successful every outing. 5. The Astros are such a young team. Was there a particular player or coach that you were able to lean on in your rookie season? I leaned on a lot of people. I leaned on almost the entire pitching staff they were able to offer me different tips and pointers. Some guys were really helping and I was able to lean on them for in-game stuff. I leaned on Scott Kazmir and Scott Feldman a lot for off the field things and how to handle myself as a professional. I leaned on the coaching staff on how to go about my daily work. When I came up from the minor leagues I was used to pitching on piggy backs where I’m only going five innings or coming out of the bullpen so the coaching staff really help me on how to prepare each day. 6. What was it like to pitch in the playoffs? How does the atmosphere and the surroundings compare to that of starting a regular season game? You can’t compare the two because the game I pitched in was a potential clinching game and you can’t recreate that. I’m getting chills just talking about it and thinking back on it. Just thinking about pitching in front of all of our fans and what the game meant to our team and fans. You just can’t recreate that kind of intensity and focus, what kind of nerves you have before the game. There is just something special about playoff baseball. Even the games I watched before I pitched I didn’t quiet understand how special the atmosphere was until I was standing on the mound. 7. The Astros have such a young nucleus of talent not only at the Major League level but also a lot of talent ready to contribute at the minor league level. What can you and the rest of your teammates do to build upon the successes of 2015 as we head toward the 2016 season? For me it’s to focus just exactly how we did this past year. I didn’t break with the club but I fully understood what the goals were. The goals were to play every game as hard as possible, play all 27 outs and don’t ever take a single pitch or inning off. If you can do that you are going to get the results you want. That is the message A.J. (Hinch) was preaching to the team in spring training for the brief time I was with the team going back and forth. That is the same attitude we took every single day I was up at in Houston. It doesn’t matter where we were at in the standings we just let our play do the talking. That’s what lead to our success, we can’t allow any additional outside pressure from media or expectations change how we play on the field. A special thanks to Lance McCullers for taking some time out of his schedule and training routine to talk with us. We look forward to following him all season long as he continues to establish himself with the as one of the top young pitchers in the game with the Houston Astros. Please give Lance a follow on twitter @McCullers43 and like us on Facebook and follow us on twitter @CTD_Sypien as we continue to bring you an inside look at players big league debuts. Also be sure to follow @KsforK9s a 100% non-profit organization dedicated to helping every animal in need that Lance is involved it.